Low maintenance gardening doesn’t mean no maintenance. Every garden will need some amount of work to keep it looking looking neat and tidy. However, if you don’t have a lot of time for gardening there are few things you can do to make your life easier. To keep a lawn looking good takes work. Aside from regular mowing lawns need feeding, moss control, weed control and sometimes watering. Consider getting rid of your lawn completely or minimising the amount of lawn you have. Lawns can be replaced with patios, decks, gravel paths, large flower beds. Raised beds are great in many ways -no more bending over when you’re weeding or planting. Well planned raised beds can also be used to delineate areas of the garden. Soft outdoor lighting can be placed in raised beds to illuminate the garden on those warm summer evenings. Low maintenance gardens needn’t look dull or uninteresting. On the contrary there are loads of low maintenance plants that you can use to add colour and texture to your garden. Have a look at ground cover plants such as Alchemilla Mollis, Vinca Minor and the ever popular Aubretia. Ground cover plants help to block weeds. Large bold flower beds can be low maintenance if you choose the right plants. As a rule of thumb place large plants at the back of the bed, medium next and small ground cover plants at the front. Choose plants that don’t need much pruning and are happy to sprawl. Patios extend your living space. They are a place to entertain friends, an area for children to play and a place for you to sit and relax. A patio can be used to replace lawns. Lawns require work and in our damp climate they’re not always accessible. An attractive patio by comparison is a clean area that can be used in most weather. There are so many beautiful products that can be used to create a patio – Natural Sandstone, Liscannor Stone, Cobbles. These are just a few ideas to help you plan your low maintenance garden. For more ideas feel free to get in touch with us. 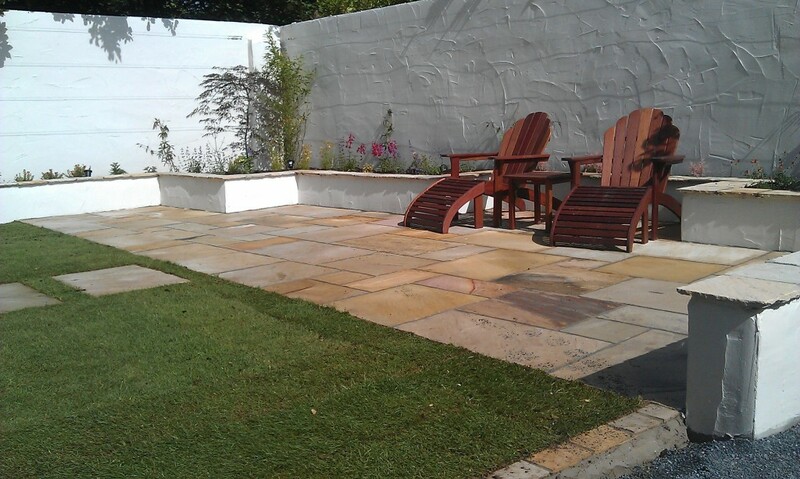 We provide a full garden design service and garden maintenance service.